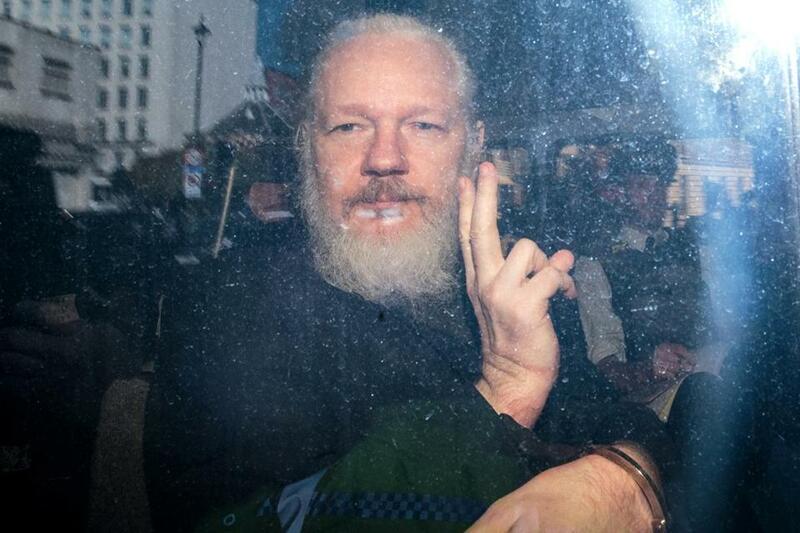 Julian Assange gestured to the media from a police vehicle on his arrival at Westminster Magistrates court on Thursday in London. LONDON — WikiLeaks founder Julian Assange was forcibly bundled out of the Ecuadorian Embassy in London and into a British police van on Thursday, setting up a possible court battle over attempts to extradite him to the United States to face charges related to the publication of tens of thousands of secret government documents. ‘‘The discourteous and aggressive behavior of Mr. Julian Assange, the hostile and threatening declarations of its allied organization, against Ecuador, and especially the transgression of international treaties, have led the situation to a point where the asylum of Mr. Assange is unsustainable and no longer viable,’’ Moreno said. ‘‘Powerful actors, including CIA, are engaged in a sophisticated effort to de-humanise, de-legitimize and imprison him,’’ the group said in a tweet over a photo of Assange’s smiling face. 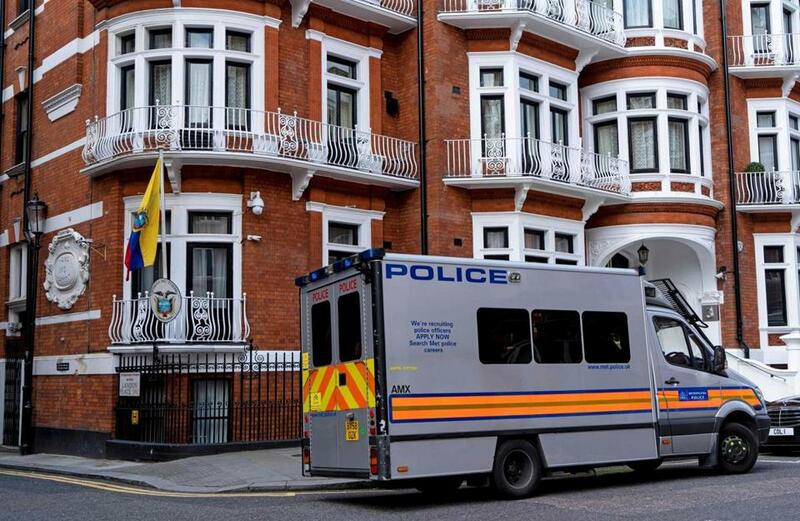 A police van is pictured outside of the Embassy of Ecuador in London on Thursday. Assange’s arrest came a day after WikiLeaks accused the Ecuador’s government of an ‘‘extensive spying operation’’ against him. WikiLeaks claims that meetings with lawyers and a doctor inside the embassy over the past year were secretly filmed. But former Ecuadorian President Rafael Correa said Moreno’s decision was ‘‘cowardly,’’ accusing him of retaliating against Assange for WikiLeaks spreading allegations about an offshore bank account allegedly linked to Moreno’s family and friends. ‘‘Images of Ecuador’s ambassador inviting the U.K.’s secret police into the embassy to drag a publisher of —like it or not — award-winning journalism out of the building are going to end up in the history books,’’ Snowden said in a tweet. ‘‘Assange’s critics may cheer, but this is a dark moment for press freedom,’’ Snowden said from Russia, which has granted him permission to stay there while he is wanted by the U.S.